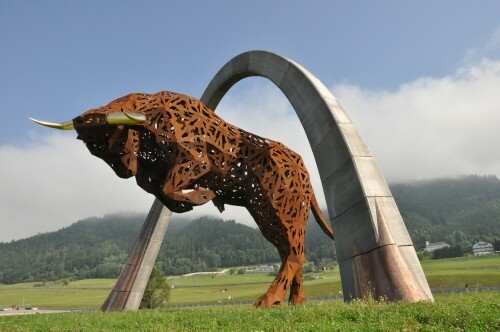 The sculpture as a whole represents a jumping bull through an arch, and serves as a landmark for the Red Bull Ring in Spielberg. 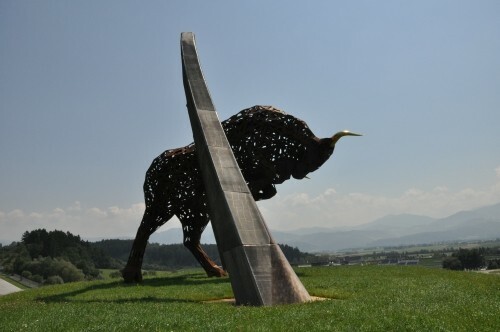 In view of a height regarding the bull of about 12m as well as regarding the arch of about 17m the enormous scale of the sculpture becomes apparent. 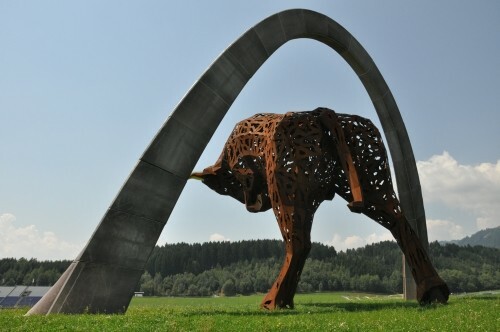 The bull is constructed of steel, the arch is made of aluminum. 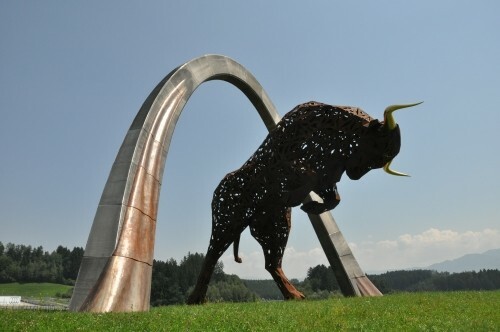 The steel weight of the bull is about 42 tons, the aluminum arch weights about 14 tons. For the “skin” of the bull, consisting of over 1200 triangular panels, COR-TEN steel is used. This paricular type of steel is characterized by forming a rust layer when weathering at the surface. This rust layer protects the remaining part from further corrosion. The primary steel structure regarding the bull was copied from an animal skeleton. The “skin” as the outer contour is connected to the bull skeleton by rods of different lengths. The horn of the bull was cast in aluminum and is coated for protection against weather with gold leaf. The aluminum arch completes the work of art. The arch consists of single cast aluminum parts, which are connected on site.